The 10-year aftermarket for gas turbine-only maintenance has declined from around $239B in 2015 to $200B in 2018, down nearly 16.3% in the last 4 years. Any gas turbine aftermarket study begins with an analysis of the installed fleet and likely changes over the coming 5 to 10 years. As the foundation for this analysis, we maintain a database that tracks over 37,000 installed gas turbines, unit retirements, utilization rates, and operator mergers and acquisitions. Gas turbine unit capacities ranging from Solar’s Saturn up to and including the largest G/H/J technology units are included in our analysis. We also track current and projected OEM contract coverage as this has a significant impact on outside competitive access to their gas turbine units. There are several additional dynamics to consider regarding the OEM service contracts employed. First, when an OEM is competing for the sale of a new unit (and/or power plant), the competitive evaluation will normally be the combination of capital expense (for the cost and installation of the plant), fuel costs and maintenance cost. Second, the analysis should onsider the fact that some percentage of the aftermarket may be sold at a discount due to this process and some percentage of aftermarket services may be sold at a premium. Over the years there have been several debates about what the method is for recognizing revenue and profit for a service contract. It is a complicated subject and it is not an issue that is unique to one particular OEM or even the industrial gas turbine market alone. 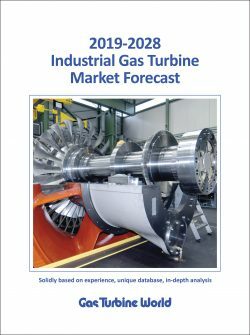 Many readers painfully know that the Industrial Gas Turbine (IGT) marketplace is facing a rather harsh adjustment and decline in new unit orders and associated aftermarket products and services needed to maintain existing and future gas turbine installations. Over the last 12 months we conducted over 50 interviews with major players in the O&M marketplace aimed at developing a realistic view of current conditions and of what to expect over the next 10 years. 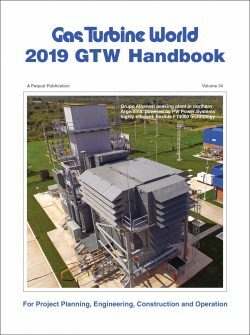 They included major gas turbine OEMs, authorized and unauthorized service providers, supply chain manufacturers and end-users. This article offers a sneak-peek into how the market is likely to change. Our projections and conclusions are based primarily on views and data collected during those interviews – tempered by an intimate knowledge of the industry accumulated over the last 20 years. There has been a steady decline in new unit orders over the last six years with Total Capacity Ordered (MWs) down 45% since 2012 (see Figure 1) and Unit Orders down 60%. The delta between MW orders and Unit orders reflects the recent trend toward larger units. The decrease in new units and total new unit capacity is mainly due to global additions of renewable generation capacity which more than offset the retirement of coal generation capacity. Much has been written about the accelerating pace of retirement for aging coal units and the expected capacity replacement by natural gas. However, as demonstrated in Figure 2, coal retirements in the US have been more than offset by renewable additions, a trend expected to continue far into the future. Global trends follow the same pattern. The Energy Information Agency projects as much as 80GW of renewable generation will be added in the United States alone between 2018 and 2021. At 20GW per year, those renewable additions would return the IGT market back to its 2012 market levels if gas turbines were employed instead. The shift towards renewable generation sources is undeniable. 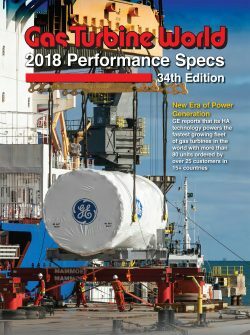 There are gas turbine additions projected by the EIA, but many will be used for peaking and mid-range duty, with only the largest and newest high efficiency gas turbines being utilized for baseload. All these factors contribute to the impact on the annual aftermarket forecast. We predict that IGT unit orders will remain nearly flat over the coming 10 years, with a projected growth rate of only 0.7% annually for the Electric Power Utility (EPU) sector and only a slightly higher rate for the Oil & Gas (O&G) sector. The higher growth rate for O&G reflects an already highly depressed market making a modest recovery. The continuing downturn in new unit orders, with the reduction in forecast utilization rates will adversely affect the service and support markets. 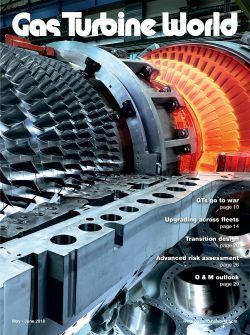 Our 10-year projection for the IGT aftermarket covers over 90 gas turbine models. The analysis includes retirement of installed capacity, new additions projected, and changing dynamics in terms of utilization. One of the biggest factors adversely affecting the aftermarket is the low utilization rate for aeroderivative gas turbines and heavy frame units. The net result is a global annual forecast decline from a compound annual growth rate (CAGR) of 4.1% in our 2015 to 2024 forecast to only 2.9% in the 2018 to 2027 ten-year forecast (see Figure 3). The projected aftermarket revenue includes all gas-turbine-direct related activity — but it does not include related services that may be associated with power plant maintenance. The 2.9% CAGR reflects several factors that include a drop in new unit additions, lower utilization for certain markets and gas turbine models, and a shift in the overall size and technology level of new unit additions. Another way of quantifying the aftermarket is to look at the overall 10-year value for the IGT-only market. In 2015 the IGT aftermarket was projected to have a 10-year value of circa $239B. The latest evaluated 10- year value is now circa $200B, down nearly 16.3% in just 4 years. the largest gas turbines operate in either a cogeneration or a combined cycle plant, where utilization is heaviest. These gas turbines are likely operated at full rated power output rather than at part-power conditions. The largest gas turbines contain a higher quantity of expensive materials, coatings, and labor. In addition, the repair of components on larger parts are more expensive. Our 10-year analysis of the aftermarket also exposes changes across different regions and sectors. In terms of overall market splits for the Electric Power Utility sector, North America and Europe are expected to lose aftermarket share, while Latin America and the Middle- East remain fairly flat. Africa and Asia-Pacific are projected to grow more rapidly. In the Oil &Gas sector, North America will decline the most in terms of the revenue share in 2027 while Asia-Pacific will expand the most. Other regions will be nearly flat in share growth. Not that development of Oil &Gas activity in North America will significantly degrade, but because the O&G market will not rely as heavily on gas turbine assets. In both the Electric Power Utility and the Oil & Gas sectors, relatively flat new unit growth rates, rising deployment of renewable generation, and even the slow but steady expansion of plug-in electric vehicles (which reduces oil demand) are all contributing to a reduced outlook for the aftermarket. There are upside and downside scenarios evaluated, both of which reflect a significant impact on the 10- year forecast. But the general trend remains the same.